In the ancient Greek myth The Odyssey, Penelope is the faithful wife who waits for decades for her husband's return from the Trojan Wars. Besieged by suitors, all keen to convince her that Odysseus is gone for ever and she should remarry, Penelope devises a plan to deceive them. She says she will remarry when she has woven a shroud and spends each day diligently doing so – but each night she unpicks her work of the day before, ensuring she will never complete the task. In literary tradition Penelope has been upheld as the ultimate in marital loyalty – her name appears in various romances and plays through to the present day. But here Caroline Horton shows us another Penelope. Sitting on her marital bed, still dressed in her wedding finery, this Penelope is a multi-faceted flesh and blood woman, not some romantic ideal. A monologue, Horton shows us both the public and the private face of Penelope. In public she remains the perfect wife. Many of these moments are bitterly humorous as Penelope shares her views with 'militarywives.com'. Here she exhorts other military wives to keep their house clean for their husbands' return or she smiles brightly as she answers a series of questions about her marriage. But alone, Penelope rages against a man whose love for war, travel and other women is more important than his love for his wife and his son. She unpicks his legend and lays bare his selfishness, his pride and his self-righteousness. It helps to know a little of The Odyssey or some of the references could be missed but it is not essential. Horton ensures the audience knows of her husband's long absences and explains some of the elements of the tale. 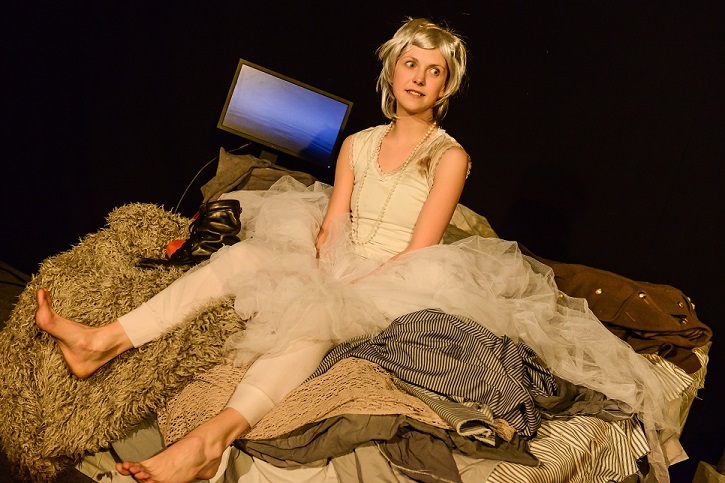 An associate artist of The Rep, Birmingham-based Horton is a highly talented story-teller whose quirky performances always leave you with plenty to ponder. This production is not as beautiful as her You're Not Like The Other Girls Chrissy, which told her grandmother's story, or as shocking as Mess, which explored eating disorders, but it still packs plenty of punch. At an hour long, it flips between humour, anger and sadness – here is a woman locked into a situation from which she sees no escape. Her ultimate choice for freedom is a strong form of self-expression both physically and mentally which ends the production on a high note.